WE WILL ALWAYS GET YOU BACK TO YOUR SHIP ON TIME! This was by far the best part of my trip to Belize. Everyone needs to try this at least once in there lives!! I will be going back next year. Also I recommend you ask for Adolfo and Elie to be your tour guides they made the entire trip fun and exciting!!!! They are seriously the best!!!! My husband and I reluctantly booked an excursion outside of Carnival, our cruise line. I assumed that since I booked an excursion through an independent I was taking a risk... but boy was I wrong! From the very beginning our experience with Cave-Tubing.com was awesome! We had a great time! They were fun and made accommodations for everybody. 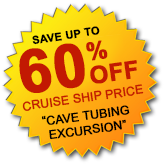 Always book your excursion from Cave-Tubing.com - Never book through the cruise line. You pay half the price and have twice the fun! I wouldn't take the time to type a review, if it didn't mean anything to me. Great bunch of guys and gals associated with this company. At no time did i feel uncomfortable. Instructions were great and right on the money. They had someone with a sign waiting on us outside the terminal. The ride was about an hour to the site on an air conditioned bus. We added the zip-line, these were great ziplines. Cave tubing is easily the most popular attraction in Belize and nobody gives you better service than the guys with Cave-Tubing.com. We booked online with the group only two days in advance when we were in Belize and were greeted promptly by the owner Yhony. He organized to have us picked up in Belize city and when we arrived it was Yhony himself who picked us up in his own Escalade! We do our Cave Tubing tours inside the Nohoch Che'en Caves Branch Archaeological Reserve. The reserve is managed by the National Institute of Culture and History (NICH). Best Prices, Safe & Reliable Service! We go to the same caves as the cruise-ship-booked tours. "We will get you back to your ship on time!" If your ship is making a stop in "BELIZE CITY" you are welcome to BOOK WITH US. IMPORTANT NOTICE FOR ALL CRUISE SHIP PASSENGERS VISITING BELIZE CITY: Please note that Belize City does not have a docking facily for cruise ships. All cruise ships visiting BELIZE CITY, must anchor in the Belize City harbor. To get ashore and to our pick up point, you will need to board a smaller boat called a tender. It takes approximately 20 minutes to tender ashore. Once ashore, you will need to exit through terminal 1 where our guides will be waiting for you with your name on a sign. We are your cave tubing tour specialist, offering the very best Cave Tubing Tour in Belize as well as a high-energy, adrenaline-pumping ATV Jungle Tour and Zipline Adventure. You can choose to do one, two or combine all three activities for the ultimate Belize Adventure. Our tour packages are specially designed for cruise ship passengers with pick up at the cruise ship terminal in Belize City. 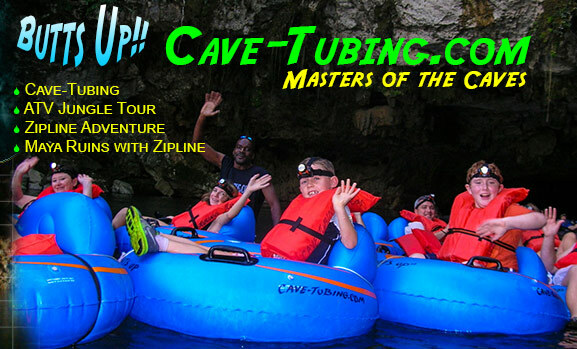 Your entire group will experience the Cave-Tubing.com VIP service. 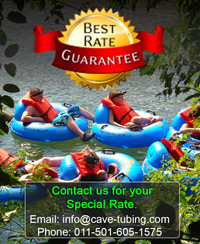 Our Cave-Tubing Price: Always Unbeatably Low! 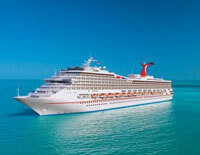 Cruise Ship Passengers, save up to 60% When You book with us. See combo tour package prices. 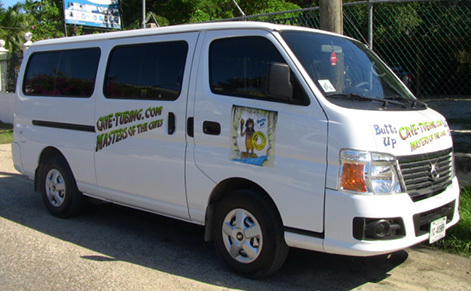 We offer free pickup within Belize City so if you are staying in Belize City we can pick you up at your hotel. If you are coming in from the islands we can pick you up at the airstrip or water taxi terminal. Cave-Tubing is the most popular shore excursion in Belize and it is our specialty. Our well-trained guides love what they do and will make sure you love it too. They will go the extra mile to make you feel comfortable and to ensure that you have a lot of fun. So if you are looking for something fun and spectacular to do in Belize, this is it! Guided by our experienced Belizean tour guides, you will hike for about 30 minutes through the Belizean rainforest then tube down the refreshing Caves Branch River and through spectacular cave systems, which the ancient Mayas regarded as a sacred underworld and home to many powerful gods. It's an exciting adventure you'll never want to end and one you will always remember. 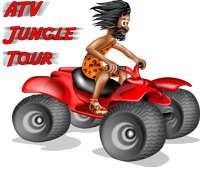 Our Exclusive ATV Jungle Tour is the perfect tour for those who like a good adrenaline-pumping adventure or for the out-door enthusiast who just likes to have a good time. Anyone can do it. Children too young to ride on their own may ride with an adult. The trail is perfectly safe and the terrain is mostly flat. Our jungle trail is 5 miles of twists and turns through the Belize rain forest and offers loads of fun for everyone. Our ATV Jungle Tour property is located just five minutes (3 miles) before the Caves Branch Archaeological Reserve where you can also enjoy our very popular Belize Cave Tubing Tour. Enjoy soaring through rainforest canopy on the SAFEST Zipline course in Belize. This zipline course is located inside the same park where the cave-tubing tours take place (Nohoch Che'en Caves Branch Archaeological Reserve), making it easy for you to go from zipline to cave-tubing with no hassle at all. It features a "beginner's zip run" of 150 feet and six other zip runs that range in lengths from 200 feet to 600 feet between treetop platforms secured in the canopy of tropical hardwood trees. Intriguing karst limestone cliffs provide a scenic backdrop as you zip through the rainforest canopy. This zipline course is second to none in Central America and the Caribbean. It is fully insured and also certified by the Association of Challenge Course Technology (ACCT). 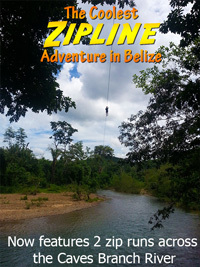 The zipline guides have specialized training and many years of experience and will take very good care of you. We provide our guests with safe and reliable transportation. We own and operate our own coach buses as well as mini vans. We can handle groups of any size. 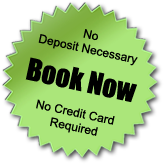 Our reservation process is easy and hassle free. No advance payment or deposit is necessary. Book Now and pay later! It's as simple as that. Experience the rain forest, explore our caves, enjoy the river, breathe the fresh air and pay when you're done (for cash payments only). That's the Cave-Tubing.com way! It's our way of demonstrating to you our confidence in the quality of service we offer. It also motivates us to work harder to satisfy you so when the time comes for you to pay, you'll be more than happy to do so. So go ahead and make a reservation for your Belize Cave Tubing Adventure Tour. Our friendly staff is standing by to receive your request. Normally, all reservation requests are responded to almost immediately. If you have any questions, please feel free to contact us using any of the methods below that is most convenient for you. For Quickest response time please contact us on WhatsApp. Also, for quick answers to frequently asked questions you can visit our Frequently Asked Questions page. Cruise ship passengers, enjoy a complementary beer or cocktail served at our jungle palapa. Have Questions? Need to make a last minute booking? Contact us on WhatsApp. 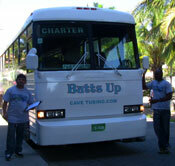 Prepare to capture moments of the wonderful experience you will have in Belize. Remember to bring your camera. We have departures for cruise ship passengers every 15 minutes so we can guarantee your departure within 15 minutes after you exit terminal 1. This means you won't have to sit in a parked bus for too long waiting on other passengers to show up. WE CARRY TUBES FOR YOU!! 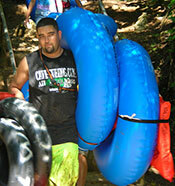 We'll take your tubes for you to the river so you can relax and enjoy the nature trail in comfort. Our tubes have backrest and handles to provide added comfort and safety for you when you are on the river! Book your Cave-Tubing adventure directly with us and save big! Not visiting Belize on a cruise?